Chevrolet revealed the Chaparral 2X Vision Gran Tursimo (VGT) Concept - a revolutionary interpretation of the ultimate race car, developed exclusively for fans of the PlayStation 3 racing game, Gran Turismo 6.
celebrates the future of automotive design and innovation, the Chaparral 2X VGT concept is inspired by the innovative race cars Chaparral Racing and Chevrolet partnered on more than 45 years ago. "This concept is an audacious and ambitious vision - and one that demonstrates to a new audience how Chevy's engineering and design teams challenge norms and explore the technologies of tomorrow," said Clay Dean, Executive Director of advanced design. "It also an ode to a unique partnership that pioneered ground-breaking technologies that are used today on the track and the street." The Chaparral 2X VGT's concept propulsion system is inspired by technology derived from advanced work targeted at space travel and future aircraft design. It features a mid-mounted laser beamed-energy propulsion system, which pulses beams of light that focus in a shroud, creating shock waves that generate tremendous thrust in the lightweight race car. With a 671-kW laser, powered by a pack of lithium-ion batteries, and an air-powered generator to provide 900 hp worth of thrust, the Chaparral 2X VGT will be capable of a 240 mph top speed in the videogame with 0-60 acceleration capability of 1.5 seconds. The propulsion system's position in the composite chassis complements an unconventional yet highly active prone driver configuration - face down with the driver's arms and legs splayed toward the wheels. In fact, the race car's propulsion and suspension systems are built around the driver, enabling progressive strategies of active and driver-adjustable aerodynamics. The driver-enabled aerodynamics eliminate the need for large, conventional wings and other aero devices used to generate grip-enhancing downforce - an attribute that helps reduce the overall mass of the Chaparral 2X VGT's minimalist structure. Only essential elements are on board, with instrumentation, for example, projected on the driver's helmet visor. 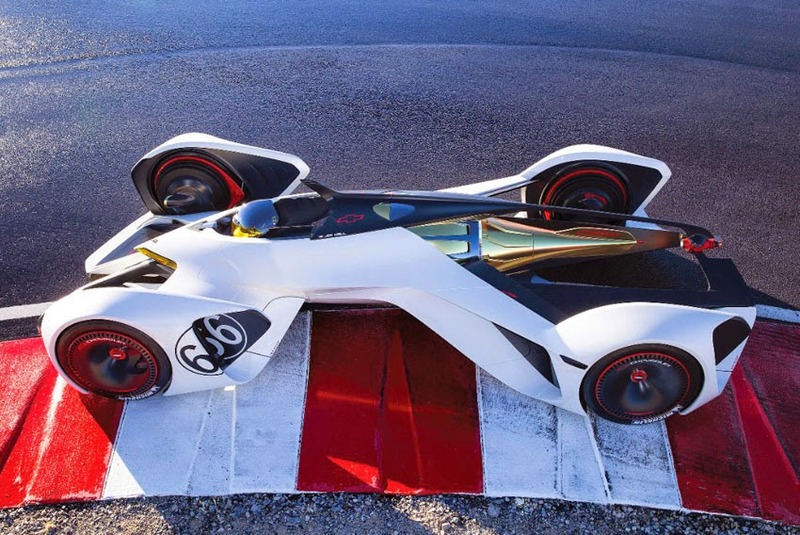 The Chevrolet Chaparral 2X VGT Concept is on display at the Los Angeles Auto Show through November 30, 2014.